Also +1 on the Sofirn C8F which seems so far to be my all around go to - it has pretty much of everything - enough throw, plenty bright, enough spill, good ramping UI, mechanical forward clicky so no parasite drain.. If only it would've been a single emitter (with the efficacy of the 3 it currently has tho) like a C8/GT Mini and with a more refined beam pattern.. The Swiss Army Knife conundrum, having everything everybody wants all the time… due to the very nature of a flashlight, someone is guaranteed to be disappointed no matter how epic a light is made. Hence, the reason some of us have so many. 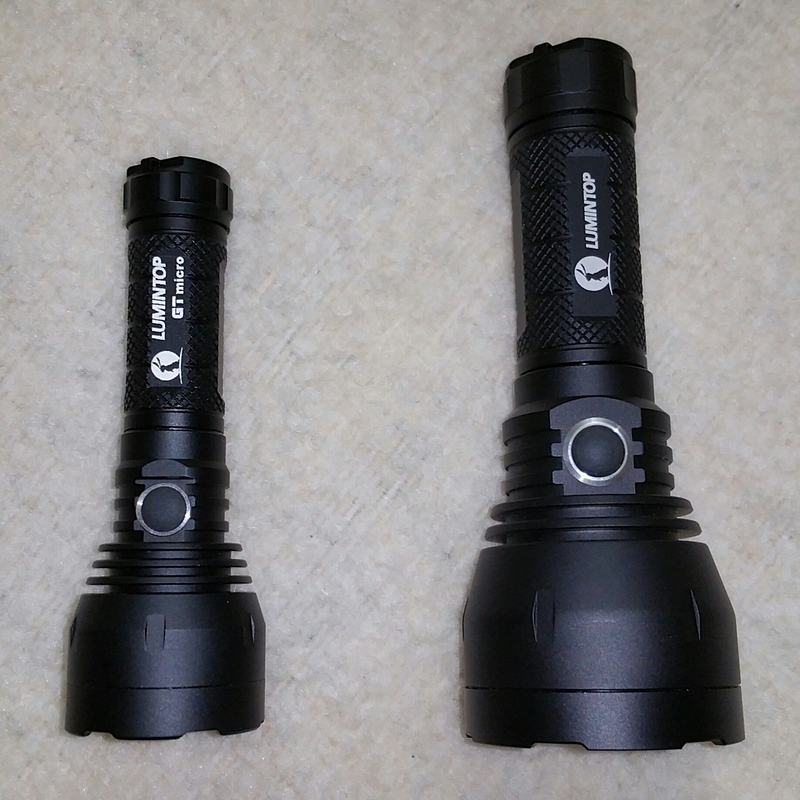 The Lumintop GT Mini, hhhmmm, thought it’s using NarsilM but no mention of it? Why? I agree — I’d like an explanation of the 2.5A turbo as well. I don’t know if anybody has actually answered this yet, but the 2.5 amp that was mentioned in the early version of the GT manual was just a misprint. It was copied and pasted from the original GT manual. It can be disregarded. 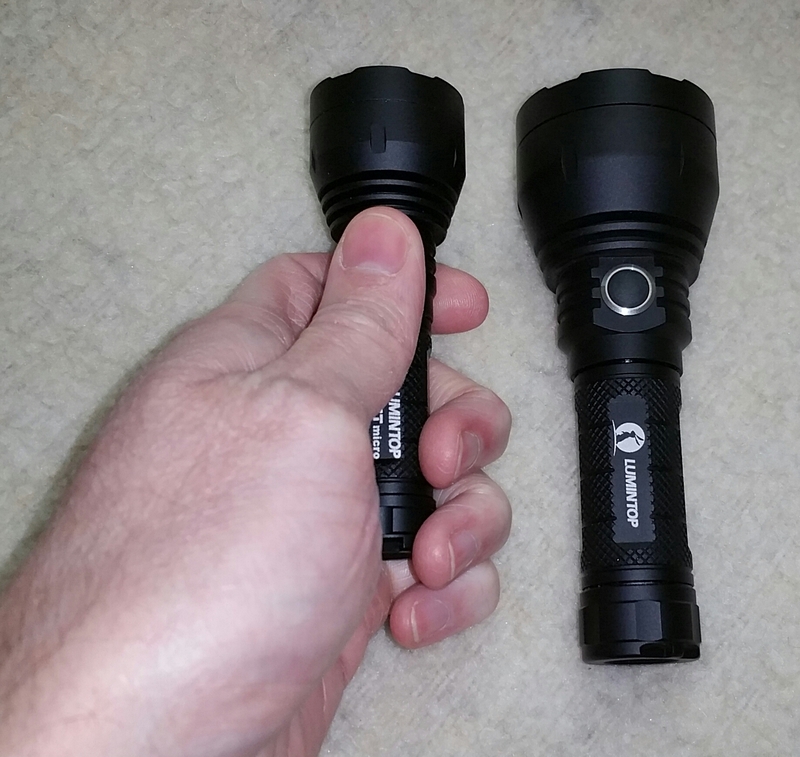 Apparently Lumintop is still inadvertently using that 2.5 amp rating for the Micro. I recieved a Micro from Neal today. It’s pretty cute and pocket friendly. I’ll do a quick review of it. The quality is just as good as the Mini, just smaller. I have the Cool White version. Unfortunately I only had a protected Evva 800mah 14500 non-high drain battery in my stash. I did some tail cap amp draws using the UT210E clamp meter. Turbo amperage dropped fast due to this battery. I thought about buying a Windyfire and wait till it gets in to report my findings, but I decided to rip the protection circuitry off instead to see what happens. There was only a small increase in output. I used my Maukka calibrated TA Lumen Tube to measure the output. To measure throw I use my LX1330B lux meter at 10 meters. At 10 seconds I got 53Kcd or 460 meters. At 30 seconds the output dropped to 46Kcd or 429 meters. Not bad for a tiny light running on a not so great battery. I want to order a high drain cell to see what it can really do. Parasitic drain was lower than the Mini at 140 microamps with the switch light on and 0.3 microamps with the switch light off. The Mini was 180/20. Did anyone else get a super low drain for the switch light being off? That’s crazy low drain. The rubber button is just a tiny bit smaller on the Micro. I recieved my high drain Windyfire 650mah button top battery. Here are the updated numbers. Tail cap amp draws using the UT210E clamp meter. Maukka calibrated TA Lumen Tube to measure the output. At 10 seconds I got 63Kcd or 502 meters. At 30 seconds the output dropped to 60Kcd or 490 meters. Thanks Jason for the valuable data. Now we just need to see how it performs with the White Flat. 100kcd would be real nice for the size. looks very small or jason has gigantic hands lol, but i hope now they will go even smaller, the gt nano like half the size or smaller of the gt micro that would be fun hope it can be done. That seems way too low. It uses the well-known FET+1 Avenger design with Narsil. 20uA are recommended there to charge the sample-and-hold capacitor inside the ATTiny to a reasonable level. It could be that they used a different resistor combination to get that low drain, someone with a production light would have to check that. 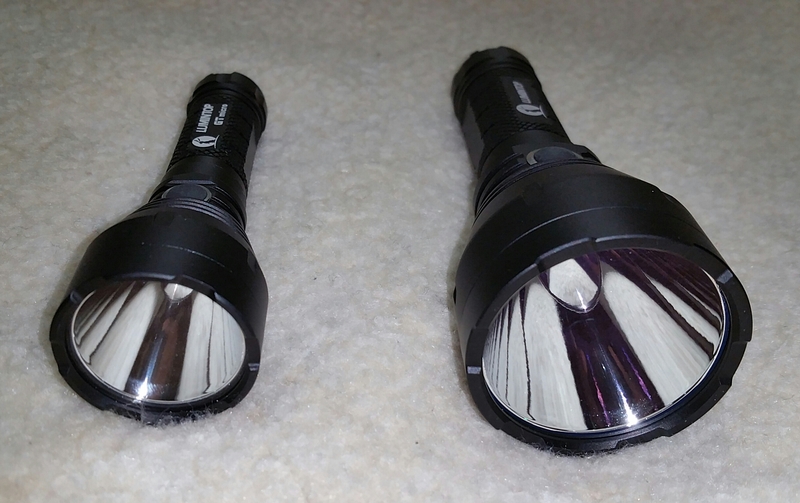 Excellent review, pictures, & info Jason, thank you!! Great reviews… waiting anxiously for mine! Jason, how long was the shipping ? Thank you. I think Neal spent some extra money on shipping so I would get it fast and post up what I think about it. It took 8 days. Regular shipping will probably take 2 weeks or so to the US. That’s what it typically takes (outside of the busy holiday season). Have they started shipping them yet? @JasonWW, I’m personally getting 179uA on standby, and 15,96uA with switch LED off. Your reading is insanely low. Probably the lowest of all e-switch lights. I don’t know, maybe my DMM is not good at measuring super low amperage? I’ve got 2 of the Boruit D10 headlamps which have e-switch drivers. One measured 0.3 microamps and the other 0.6 microamps. My GT mini measure 20 microamps with the led off. My Sofirn Q8 measured 22 microamps with the led off. My S43S measured 24 microamps with led off. So I would expect the Micro to be in that same 20-30 microamps range. I’ll try and borrow a 3rd meter to see what it says. I do want to point out something kind of unusual in the way that my Micro behaves. If I use the shortcut to turn off the switch light and then disconnect power then reconnect power, the switch light will stay off and the light does not give the usual two blinks. If the switch light is on and I cut battery power then reconnect power I get the normal two blinks. Usually removing battery power resets the light. I can only guess that there is a capacitor that is supplying power to the driver in it’s sleep state so that it doesn’t even notice the battery was disconnected. None of my other Narsil base lights do this. Just kind of odd and I thought I would share. I say “comparatively short” because a drive across Houston TX can be he equivalent of driving out of state for a lot of people. lol Even so, ordering from them should net results next day or possibly 2 days since you’re in the same city. They also don’t do walk-ins. Only appointments for large bulk orders. They are located in a commercial office park with no retail space. Here is Matt’s video review on the Micro. He uses a WindyFire battery and got a bit higher amp draw than me as well as about 980 lumen. 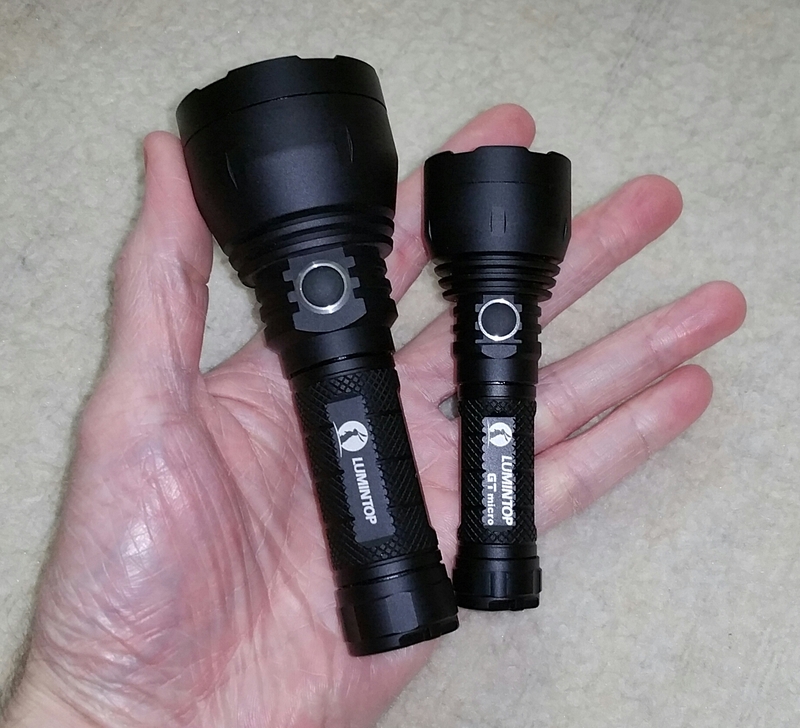 With an 18650 cell it draws 5.5A, same as the Mini. So it’s definitely battery limited. I’ll give IMR a call Fri and maybe I can slip in and buy a battery from them. Who knows. 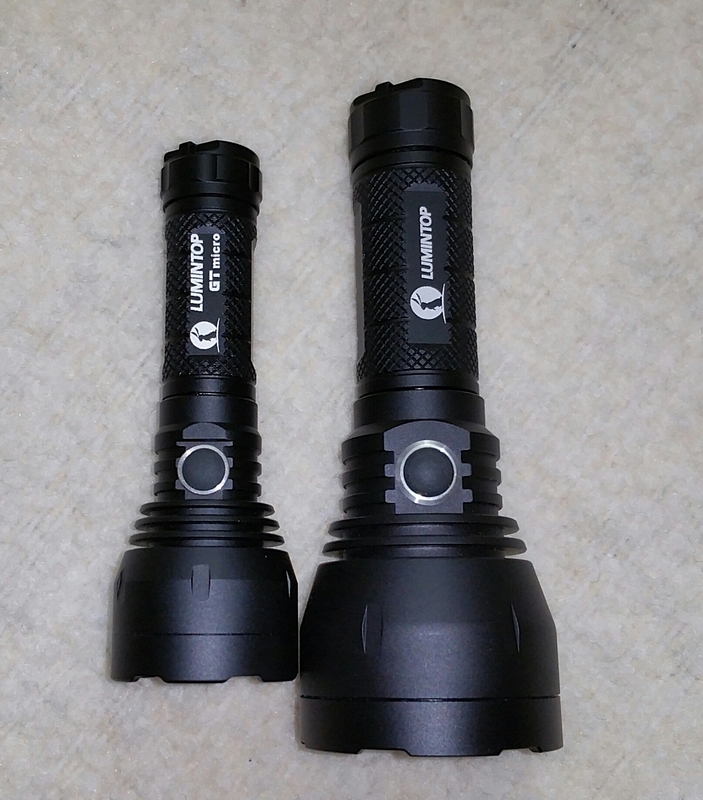 Maybe Lumintop could make an optional 2 cell tube running 14500’s and then use one of those parallel battery converters like I think it was Old Lumens had made one. If there is enough side play to run some thin copper strips maybe with a wrap? Or something made on a 3D printer. Probably a dumb idea as it isn’t micro after that. Not stupid, but quite expensive. 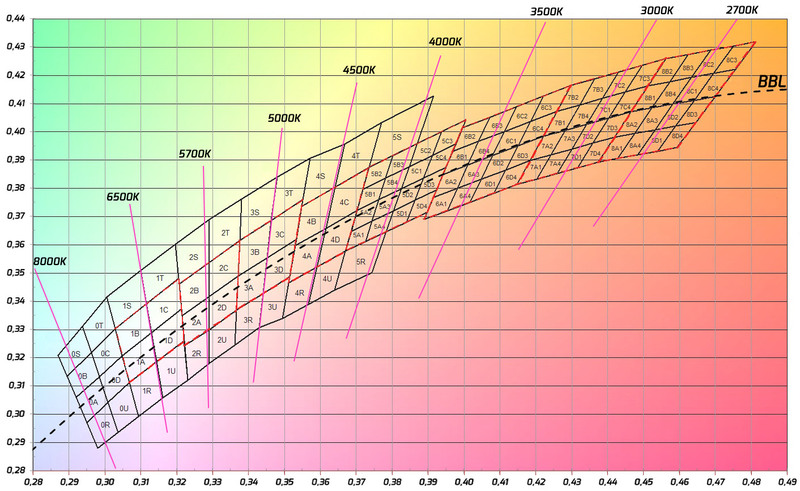 Muto, why not go to a boost driver with two 14500’s running an XHP-35 HI? They do make 14250 (1/2AA.) Wonder if that’s work? Boost driver Louie, single cell. The 14250’s capacity is horribly low, running a pair of em is pricey on the output vs runtime. I know all too well, have done it a lot. I’ve run MT-G2’s in chopped AA MiniMag’s as well as a lot of other variants. lol Until recently I had an XHP-50.2 in a copper X5, changed it all out in favor of a White Flat. 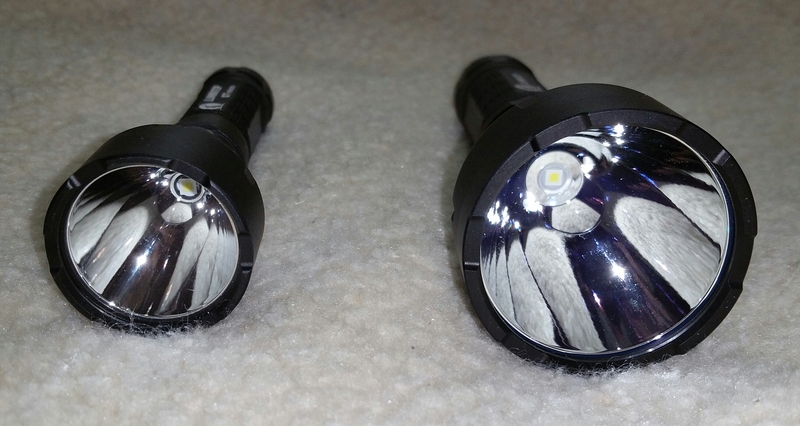 Edit: Yes, you could use a 2xAA light and 4 of the 14250’s with a LED4Power driver set up for the 12V emitter. That would work too, but run time would still be pretty lousy. Wasn’t that long ago, but was just wondering what’s the usual… “lag time”… between ordering and shipping?